“A couple of days off running,” the doctor says. Then days turn into weeks, and weeks turn into months. Not just running but now you have to take time off of cycling too. However it plays out, being injured is a challenging time. The majority of us have been there, and if not, chances are you will if your aim is to better your best. Ever since my victory at IRONMAN 70.3 Texas back in April of 2015, I’ve been sidelined from racing due to a complicated, and persistent, right-sided knee injury. It’s been horrendous and the most challenging 12 months of my career, but we’ve learned a lot. As I write this, I am edging my closer to a start line. My body is close to full health and as my fitness builds, soon it will be race time again. Nothing excites me more than the thought of battling with the best in the world. But how did I get here? How did I, and so many others, get through such a long period of injury? When healthy and fully fit, to get the best out of ourselves requires that we are able to monitor and relate to our progress. 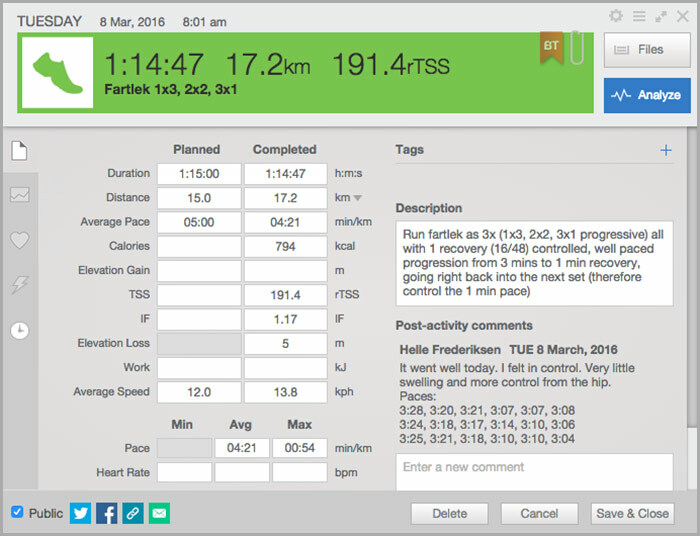 There are a number of ways to monitor and record progress, typically either a good old fashioned pen and paper diary or training management software such as TrainingPeaks are the go-to options, I opt for the latter. In the day to day training environment when all is going well, you should monitor your swim, bike, run, and strength workouts. Below is an example of a typical training day in my world, showcasing how I record and monitor. Firstly, let me bring you in on a secret; the journey through injury is not easy. Injury plays its role in shaping us. When you think it’s hard, chances are it will get harder before it gets easier. I’m now into my eighth year as a professional triathlete and I’ve encountered my fair share of injuries. However, I have been fortunate enough to battle back, learn from them, and come out on top stronger. 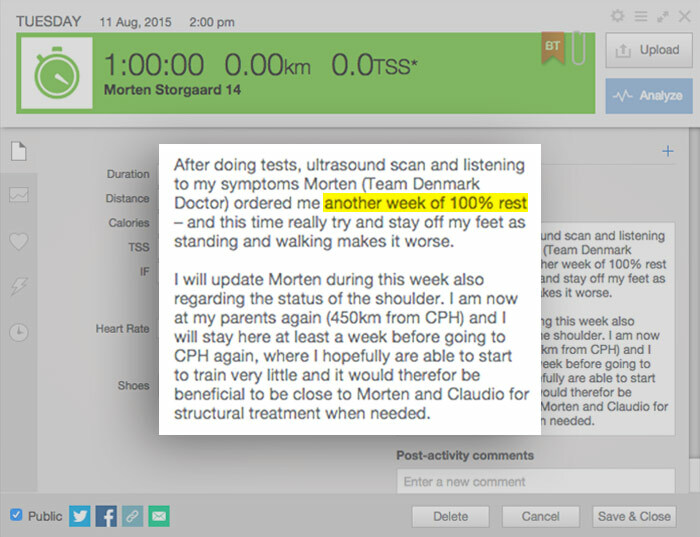 Daily monitoring and the recording of physical and mental experiences on any given day, through a period of injury, in my experience, plays a critical role when it comes to overcoming injury. Whilst this injury period has been the toughest, I’ve been able to apply my experience from over the years in a way that has helped me monitor progress, despite times when there is very little progress to see. Unfortunately, the majority of athletes, and some coaches, have a tendency to go ‘off the boil’ when faced with injury, especially prolonged injury. If injury eliminates all of the disciplines (swim, bike, run, strength, etc.) then the question is what can you monitor and keep track of. Well, actually, there is still quite a lot you can monitor. How does your body/injury feel upon waking? What movement patterns aggravates the injury the most? What, on that given day, was good or bad for the injury? Did the pain level change/develop throughout a day? What recovery techniques were applied on that day? And do they help? Did you record that massage you had? If so did you record how the injury reacted to it? Are you recognising tight spots that connect to the injured area? If so what are they? Whether an individual in this alone for pleasure, an elite athlete wanting to hit the top spot, or a person commissioning a coach to take their performance to a new level, there’s just so much we can take away from the gathering of information, small or big. Injury can often be a lonely period. Despite having loved ones invested in our journey and coaches committed to seeing it through, it’s common to feel a sense of loneliness, people can’t feel what you feel in its entirety. There’s only so much of, “you’re doing great” or, “just a couple more days rest” you can take. So make yourself and your coach accountable. Provide yourself the ability to oversee the progress at all times. There’ll be periods where progress is very visible and there’ll be periods where progress is not present. No matter the level of activity, whether fit, fast or injured provide yourself the best opportunity to get better by monitoring what you experienced each day. At some point on this injury journey I was pretty much immobile. My TrainingPeaks files from seven months ago read that walking up and down stairs was problematic. 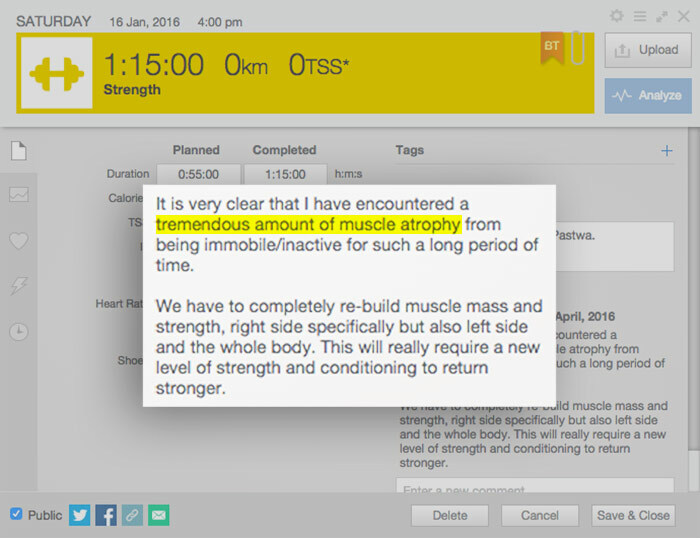 Just three months ago my account reads that muscle atrophy was significant. Today I’m not immobile, I don’t struggle walking up and down stairs and muscle atrophy is no more. I’m able to not only feel that but also read that. That’s me reading progress, “Monitoring progress when there is no progress” is worthwhile. 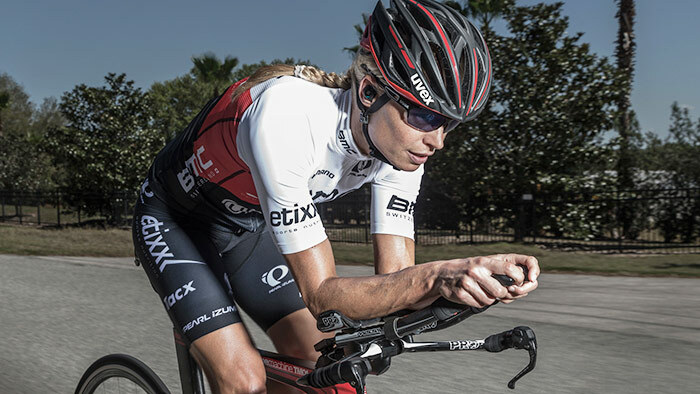 Helle Frederiksen is a professional triathlete and current holder of the fastest half-distance time by a female 3:55:50 (Challenge Bahrain 2014). A London 2012 Olympian, 6 x IRONMAN 70.3 Champion and a previous winner of the prestigious Hy-Vee Elite Cup and Challenge Bahrain, Helle holds a Bachelor Degree in Sports Science and a Master's Degree in Human Nutrition. Alongside her professional racing career Helle acts as a performance coach to multiple amateur and elite athletes and is viewed as one of the sports leading profiles, passionate about educating and inspiring multi-sport enthusiasts.